After selecting the text you would like to add a link to, use the Format > Edit Hyperlink menu option (1) or click on the link button (2) in the formatting toolbar. Enter the URL of the file you would like to link to. If you would like the link to open in a new browser window when the user clicks on it then check the Open link in new window checkbox. To quickly see the URL that hyperlinked text links to, hold your mouse over the text and the link will appear. To open the link in your web browser click on the link while holding down the OPTION key on OS X or the ALT key on Windows. 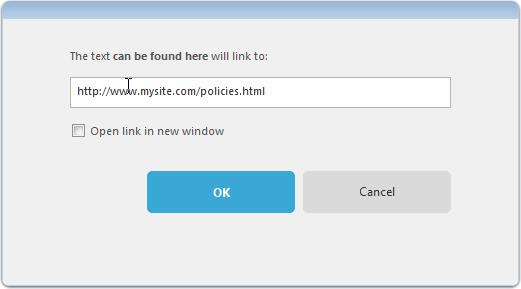 The URL dialog will help you create links to files on your local network as well. If you will be distributing the final document to co-workers then you may want to link to other files on the network. 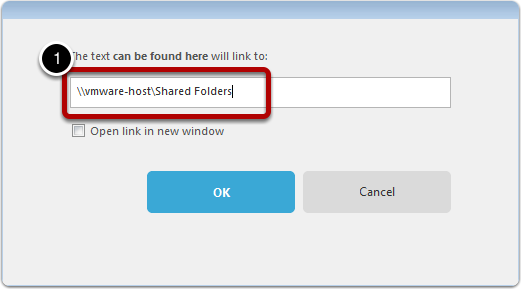 Clarify will auto-generate the proper URL for you if it can find the file or folder you enter in the URL dialog. You can paste the normal path into the URL dialog as shown below and then click OK.
Clarify will automatically reformat the path to the file or folder as a file:// URL for you. You can verify this by mousing over the link. How do we create links (bookmarks) within the document itself? For example, I'd like to say "Refer to section 1.5 for further details" etc, and then create a link so that when someone clicks on '1.5' it takes them to the relevant section in the document. ...And ideally have this text and link auto-update if additional steps are created/deleted above it, and '1.5' changes to '1.8' etc. 1) Set an anchor name for the step using the step inspector. 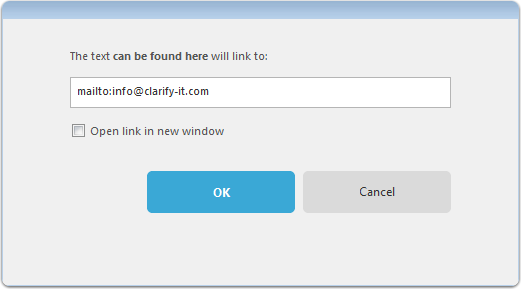 2) In the link dialog enter the anchor name preceded by the # symbol. 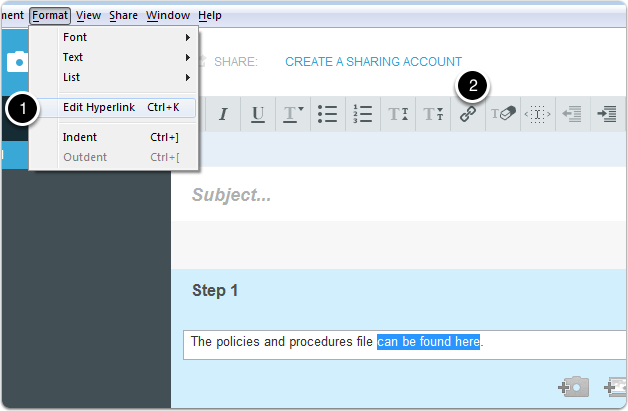 For example, if you used "MyStep" as the anchor name for a step then you would enter #MyStep in the link dialog. @Peter - I've added instructions to this article. While clicking on the link, hold down the OPTION key on OS X or the ALT key on Windows. That will open the link in the default web browser. I want to create a link that points to another lesson created by Clarity. How do I make when I export the lesson as a PDF, the link points to the pdf file of the other lesson and when I export to HTML, the link points to the html file of the other lesson? @Jérôme: You can only assign a single link to a specific part of the text. You wouldn't be able to have a link that points to a PDF file on a local file system and a link that points to a URL. You would need to choose one or the other.